The impact, or at least perceived impact, of migration on the local economy, household incomes and the housing market generates a lot of interest and conversation. Quite a few of you reached out yesterday to share your thoughts and I appreciate it! Given the feedback and questions, which are similar to the discussion our office has when we give presentations around the state, I wanted to dig into the data and post a quick graphical update to yesterday’s post for this edition of the Graph(s) of the Week. What I did was look at the 2015 American Community Survey (ACS) data for young households in the Portland metro area. I focus on those not currently enrolled in school and living on their own. These are household income figures, not per person, so any differences in the composition of households can influence the data. Also, household characteristics like age and educational attainment are based on the characteristics of the householder (formerly head of household). While imperfect, this is the best I can do in short order. Given the findings yesterday and below, I am hard-pressed to believe a more granular analysis would yield wildly different results. 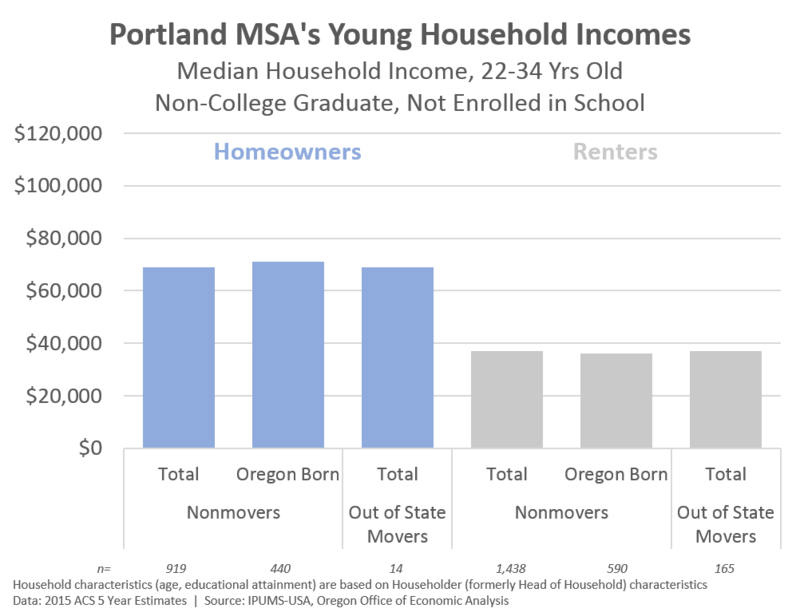 Among both college graduates (first chart below) and non-college graduates (second chart), there are minimal differences in household income levels for current residents, current Oregon-born residents, and out-of-state migrants. This holds true when focusing just on homeowners, or just on renters. Within each segment shown below, the median household income figures are very similar, with only a few thousand dollars in differences at most. Given the sample sizes, some of which are very very small, such differences are unlikely to be statistically significant. Furthermore, in results not shown here due to sample size concerns, income levels from [insert state here] are also not considerably different than the results shown below. 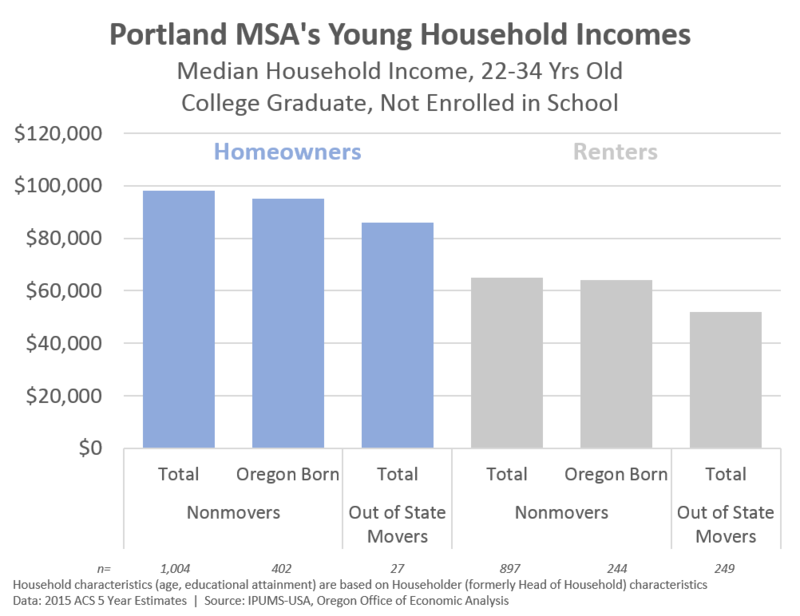 Yesterday’s post, today’s update, and additional work our office has done all point towards migration not being a major factor when it comes to the shifting household incomes in Oregon. Again, not that it’s not one factor. It’s just not the major one. The overall economy is the biggest driver of these trends. Now, as mentioned yesterday, migration is for the young, and young college graduates in particular. Such individuals and households tend to have higher income/career trajectories given job opportunities and associated wages. As such, even as migration itself does not impact the household income distribution in the short-term, it may, and likely does, have a longer-run positive impact. Furthermore, these results are for the metro area as a whole. It is likely that different neighborhoods are experiencing considerably different trends and outcomes. While that is undoubtedly true, it does not mean such neighborhoods are representative of overall trends.